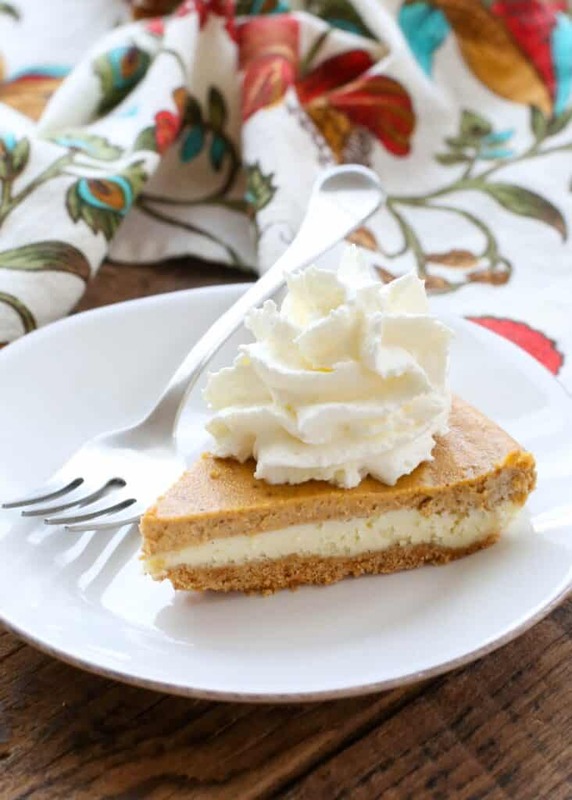 Creamy vanilla cheesecake is poured over a simple graham cracker crust and then topped with a creamy pumpkin layer to create this Pumpkin Cheesecake Pie. As much as this dessert looks fancy, this is a very simple pie recipe that results in an unforgettable finish for any meal. I’ve made a double layer pumpkin pie each Thanksgiving for years. That pie is frequently requested and it is always a hit. However, this recipe just knocked that one off the table. This recipe takes two of life’s best things, cheesecake and pumpkin pie, and combines them for a dessert experience that’s unlike any other I’ve had before. At once comfortingly familiar and excitingly novel, Pumpkin Cheesecake Pie is a new favorite I expect will become a dessert tradition for us. I love cakes of all kinds and have a special place in my heart for cakes with pumpkin. From Pumpkin Bundt Cake with Vanilla Icing to Layered Pumpkin Coffee Cake, I just can’t get enough, especially in the fall. 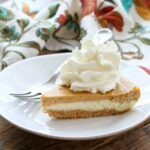 I’ve always loved pumpkin flavored cheesecake too and realized recently there was a way to enjoy pumpkin cheesecake I’d never thought of before: simple vanilla cheesecake layered with spiced pumpkin pie filling all baked in a delicious crust. One of my favorite things about cheesecake is the graham cracker crust. Making your own graham cracker crust for a cheesecake or pie is so much easier than many people think and the taste is phenomenal. All it takes to make a homemade graham cracker crust is a good amount of crushed graham cracker crumbs mixed with melted butter and light brown sugar then pressed into a pie plate and baked. The sweet buttery crust is the perfect vehicle for the layers of rich pumpkin pie filling and creamy cheesecake layer. I can’t believe I never tried layering pumpkin pie and cheesecake filling before. The two textures and flavors complement each other so well. The cream cheese layer is nothing more than cream cheese, sugar, eggs and vanilla all mixed together in sweet perfection. As a bonus, this cream cheese base is a fantastic starting point for any cheesecake variations you want to try. You could even simply top the cream cheese layer with fresh fruit, spread it into your graham cracker crust and call it a day. 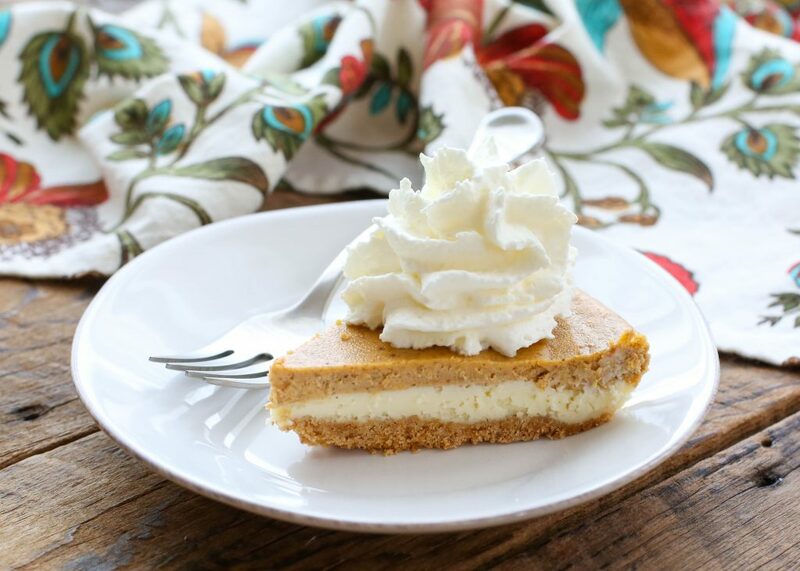 In this recipe, though, we amp things up a little by adding layers of delicious pumpkin-y goodness to the cheesecake. A basic blend of pumpkin puree and spices comes together to make the pumpkin later. I used my Homemade Pumpkin Pie Spice blend and can’t recommend it enough. The two fillings get layered together on top of the prepared graham cracker crust and baked until set. After removing from the oven, chill the pie in the fridge for several hours or even overnight. I topped each slice of Pumpkin Cheesecake Pie with a generous helping of whipped cream just before serving and heard no complaints. My whole family absolutely loved this pie and it is officially on our holiday dessert list now! Preheat oven to 325 degrees. Stir together the crust ingredients and press into 2 pie pans. 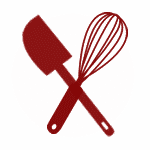 Beat the cream cheese and sugar together with a mixer until smooth. Add the vanilla and the eggs and beat again. Pour 1/3 of this mixture over each pie crust. (This was approximately 1 1/3 cups of the filling.) Stir the pumpkin puree and the spices into the remaining filling and beat until well combined. Divide the pumpkin mixture between the two pies and use a spatula to smooth it across the cheesecake layer. Bake for 35-40 minutes, until the center looks almost set. A knife inserted should come out mostly clean. Cool at room temperature and then refrigerate for 2-3 hours or overnight. Top with whipped cream, just before serving. Enjoy! For more pumpkin treats, check out our Layered Pumpkin Coffee Cake and the Incredible Pumpkin Mousse. These Pumpkin Caramel Layer Bars and this Pumpkin Zucchini Cake are on my list to try soon as well. If you’re looking for another dessert to serve along with your pumpkin holiday treat, your guests are sure to love this Classic French Silk Pie. Kitchen Tip: I use this pie plate to make this recipe. This is a very simple recipe that results in an unforgettable finish for any meal. I bet this is amazing! love it! I just want to make 1 pie this time , so how do i split this ?? I will make 2 for Christmas lol !! Will be looking forward to a slice on my next visit. This is amazing - and thanks for sharing. What size are the pie dishes? I want to make one pie. This will work in an 8, 9, or 10 inch pie plate. The thickness of the pie will be determined by the pie plate. I used a 10-inch pie plate last time I made this and re-shot the photos. Is this gluten free recipe? It is if you use gluten-free graham crackers. Can I make this ahead at Christmas and freeze it. It looks fantastic. I can't wait to try it. I honestly don't recall if I've ever frozen this one. I'm guessing it will be just fine. This can be made in an 8, 9, or 10 inch pie pan. The thickness of the pie will be slightly different for the different sizes.